Ask most people what a water ionizer does, and not only will they probably not know, they probably won't care. 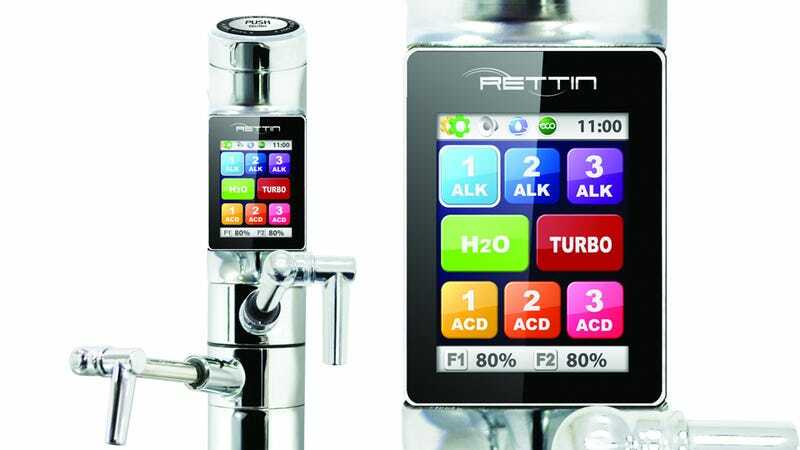 But ionizers like Tyent's new 9000T, complete with a slick touchscreen display, can make your water even more healthy than it already is. For those not in the know, water ionizers adjust the PH level of the H2O coming out of your taps—making it more or less acidic and alkaline depending on how you need it. For example, ionized water is claimed to have smaller molecules that are easier for the body to absorb, making it better for drinking while exercising. And alkaline water is supposedly high in antioxidants, which work to absorb extra errant particles bouncing around your body that can increase the risk of cancer. But it's that touchscreen interface—that looks like an iPhone strapped to the faucet—that will have most people wanting to install one of these under their kitchen sink.